Bar Etiquette 101 for all of you first-timers to the clubs – there are rules ya know! 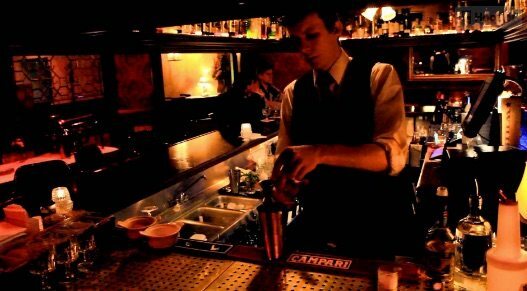 Follow these bar etiquette tips on how to order drinks at a club and no one will know you’re a club newbie. We’ve also included our Tipping Etiquette video series below since that’s the one thing that will get the attention of the bartender the quickest – by not tipping! Reese Richards from barsandbartending.com, with some ordering techniques. So, you’re at the bar and you go up to the bar and you order from the bartender. B/ Try to group all of the same drinks together. You don’t want to trail off. You don’t want to order one….uh…uh…uh… and then order the next, and then… uh…uh…sorry…uh. Ok? Respect the bartender’s time. You want to mention martinis, you want to mention cocktails, mixed drinks, first. You want to mention the beer and the wine last. Ok? The real order of ordering the drinks isn’t as important as grouping the drinks together. So, what you don’t do is you don’t order a vodka cran, and then a bottle of Labatt’s Blue, and then a vodka cran.. and then… You order two vodka cran and a bottle of Blue. Ok? So group your stuff together, and if you’re ordering shots, guys… girls… if you’re ordering shots, please order all the same shot, or at most two different kinds. Maybe six of one, six of another, ok? Order all the same shots, because the bartender’s busy, and it takes a lot of effort to layer shot after shot after shot, ok? So, when you order shots, order all the same shots. Enjoy these sassy bar etiquette videos which will teach you the best way to – and not to – order drinks at a club. Click HERE to watch the entire bar etiquette NO NOs video series on one page. Bar Etiquette NO NOs #5: What’s Good? Bar Etiquette NO NOs #7: Do you Know Who I Am? Bar Etiquette NO NOs #9: Can you Cover Me? Well there you have it – with all these tips on how to order at a club, you now have no excuse (except the alcohol of course) for not tipping and acting properly at a bar or club.